A major challenge for the carpet sector is securing the right resources to continue producing carpets in the future. Most of the carpets today are oil-based (e.g. Nylon), which is a threatened resource. Together with DNV we investigated two innovative approaches with the sector to secure the sector's supply: material recycling and bio-based materials. 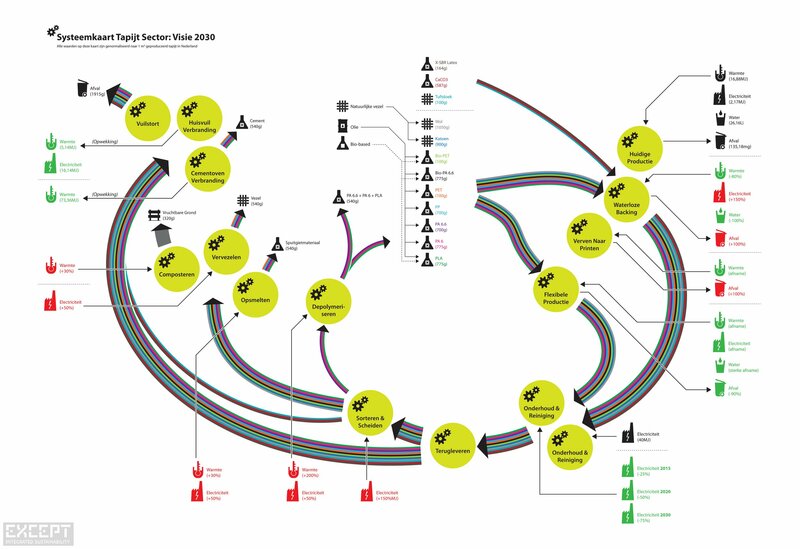 To get a grip on the complexity of the sector's flows and relations we developed a sector wide system map. 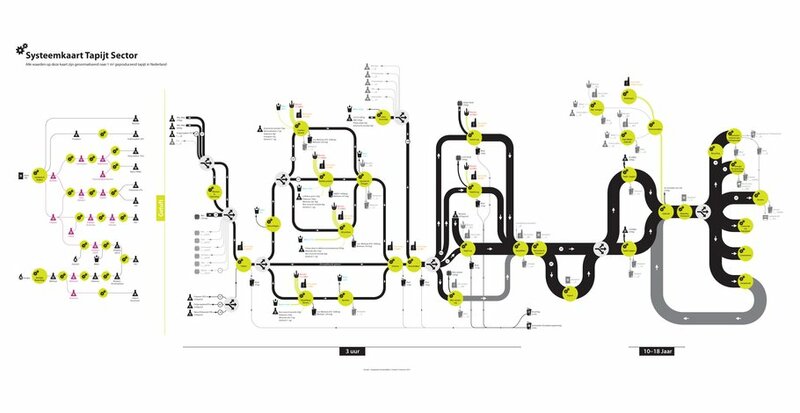 This map visualizes the material flows and makes clear how the current resource flows can be transformed into a sustainable system. Using this, we bring together the stakeholders and make strategic decisions on making circular connections, sector-wide improvements, and collaborations. Using this map, we developed a road map with all the stakeholders for the future of the sector in 2030. 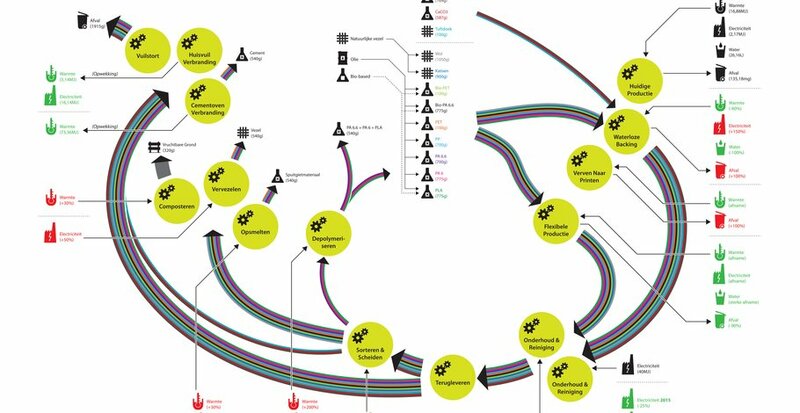 The diagram of the road map, shown on this page, visualizes the current resource flows in the outer circle. The inner circles shows how over time the application of new pathways and technologies enable the sector to transition into a circular economy. 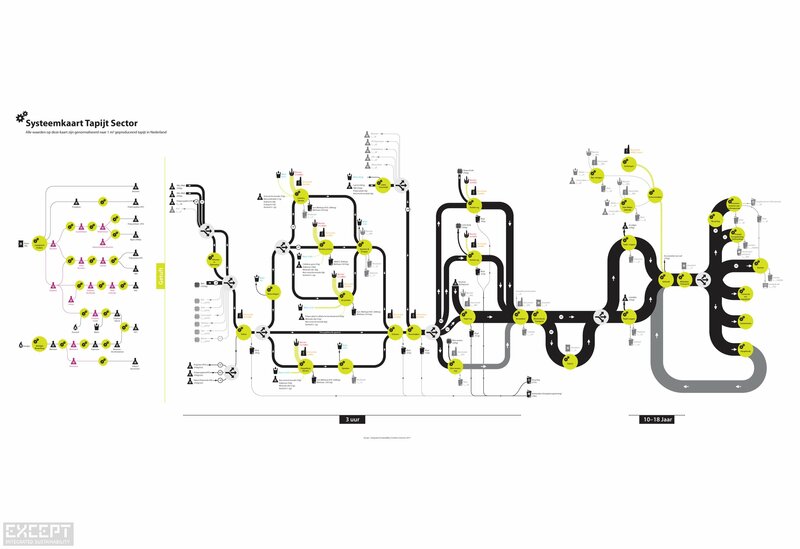 The visualization creates understanding of how the carpet sector wants to evolve its production systems and enables clear communication about future strategies. Clarity and understanding are key ingredients for the sector to work together and define sectoral programs in which competitors work together to transition the carpet sector (including the material suppliers) towards a circular business model.